Essay: Rivers of Bangladesh for Honours/Degree. Essay Rivers of Bangladesh for Honours/Degree Exam! Dear student, today I am gonna share another important essay for honours and Degree exam. You know, we're now regularly sharing all important essay, paragraph, application, report etc for Honours and Degree examination. You know, English is a compulsory subject in Honours 2nd year and Degree 3rd Year. The essay is a question of both exam with 15 Marks. For a good result, you must need tho answer the essay. NU EDU BD now regularly sharing all important essay about Bangladesh National University Honours/Degree exam. You know guys Bangladesh is a land of rivers. It has some big and small rivers around our land. Although Bangladesh is a small country it is a full land of rivers. Today we're discussing Rivers of Bangladesh. You can also write an Essay on Rivers of Bangladesh. River of Bangladesh is playing an important role in our environment. So, it's importance so long. Now let's start writing an essay on Rivers of Bangladesh. It is very hard to describe River of Bangladesh. Becuase rivers of Bangladesh are most essential for every life. People of Bangladesh are depended on of rivers. Most of the fish are comes from rivers. For a healthy life, fresh are most important for our life. And these fish are coming from rivers. Hilsha fish comes from Padma Rivers. So now let's summarize something about Rivers of Bangladesh. Introduction: Bangladesh is a land of rivers. All the rivers keep our existence on their breast. The lives of our people are shaped by these rivers. These rivers add the beauties of our country. Kind and sources of rivers: Bangladesh is criss-crossed with numerous rivers. There are different kinds of rivers the main rivers, the banches and the tributaries. Most of the rivers have their origin in the Himalayas and fall in the Bay of Bengal. The important rivers: There are hundreds of big and small rivers in our country. All these rivers surround our country in a zigzag manner. During the rainy season, all the rivers are full to the brim. At that time some of them look like big arms of the sea. In the dry season, some small rivers dry up and they look like skeletons of rivers. The principal rivers in our country are the Padma, The Meghna, THe Jamuna, The Karnafuli, The Dhaleswari, The Teesta, The Mahananda, The Pashur, The Madhumati, The Surma, The Kacha, The Barhmaputra etc. The Padma: The Padma is the main river in our country. It enters into Bangladesh through the south-west corner of Rajshahi district. It mixes with the Jamuna at Goalandh. It tributaries are the Mathabangha, the Bhairab etc. The Meghna:The Meghna enters in Bangladesh through the disctrict of Sylhet. 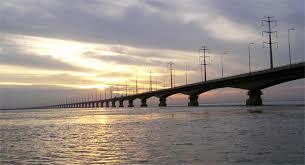 It mixes with the Padmaat Chandpur and then falls into the Bay of Bengal. The Titas and the Dakatia are its two branches. The Brahmaputra: This rivers enter in our country through Kurigram district. It is divided into two parts in Mymensihgh. One of it takes the name of the Jamuna and meets with the Padma at Foalandh. The Jamuna:The Jamuna enters into Bangladesh through the Aasam of India. Its one tributary is the Teesta and a branch is Dhaleswari. The Kanafuli: Flowing through the Chittagong District this river fall into the Bay of Bengal. Its main tributaries are the Kasalong, the Halda, The Boalkhali etc. Importance of rivers in our National economy: The rivers play a vital role for the people of Bangladesh. Their roles can not be described easily. Their roles can be summarizes as follows. (i) In Agriculture: Bangladesh is and agricultural country. Our agriculture largely depend s on the irrigation from these rivers. The rivers help to cultivate our lands in dry season. The rivers also make the lands fertile by supplying alluvium to the fields. Paddy, wheat, sugarcane and other argricultural products grow well because of the irrigation from these rivers. (ii) Supply of fish: The rivers are the source of fish. Numerous types of fishes can be found from these rivers. The Padma is the home Hilsha fish. Thus the rivers provide necessary protein for the Bangladeshis. (iii) Trade and commerce: River communication is one of the important communications in Bangladesh. This is comparatively cheap communication. The steamers, launches, boats etc carry passengers and different products from one place to another. Thus this helps to create trade and commerce. Again, mos of the hats, bazars, towns, factories, mills etc are situated on the bank of the rivers. Thus rivers highly help to expand trade and commerce for us. (iv) Source of economy: Rivers are the source of our economy. We can export food to other countries through rivers and can earn foreign money. Many people are employed in fishing in the rivers. Thus rivers help to solve the unemployment problems as well. (v) Source of power: Flowing water of the rivers is a source of energy and power. We can use rivers to produce electricity. The Karnafuli Hydro-Electric Project is an instance of this. (vi) Influence of life: The rivers expert great influence on our life. The people living near the rivers have been shaped by these rivers. Our poets, novelist etc get their essential themes from these rivers Our literature greatly owes to these rivers. Bad effect of river: Our rivers have some bad effects too. When the overflow their banks and embanks, there create floods. These destroy our lives and property. By changing this courses, our rivers also harp us by devastating different place. Conclusion: Our rivers are our pride. They help us in numerous ways. They add our beauty and boost our economy. They are an important part of our country. That's if guys, Hope you got helped by this important essay for your honours or degree exam. You can study this important essay or composition from here. We're easily written this on our website. If you also think this is helpful and important, then don't forget to share this with your other friends. and you also have any question about Rivers of Bangladesh Essay, the leave a comment on the comment section. Thank you.